This article is about the molecule. For the video game console, see Amiga CD32. 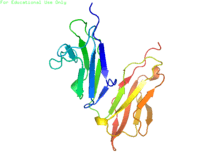 Crystal structure of the human fcgamma-receptor IIb ectodomain (CD32). It has a low-affinity for IgG antibodies and down-regulates antibody production in the presence of IgG. This feedback loop acts to lower the production of IgG by B cells when there is a surplus in the body. Monoclonal antibodies can distinguish between CD32A and CD32B. ↑ PDB: 2FCB​; Sondermann P, Huber R, Jacob U (March 1999). "Crystal structure of the soluble form of the human fcgamma-receptor IIb: a new member of the immunoglobulin superfamily at 1.7 A resolution.". EMBO J. 18 (5): 1095–103. doi:10.1093/emboj/18.5.1095. PMC 1171201 . PMID 10064577. ; rendered via PyMOL. ↑ Veri MC, Gorlatov S, Li H, et al. (2007). "Monoclonal antibodies capable of discriminating the human inhibitory Fcgamma-receptor IIB (CD32B) from the activating Fcgamma-receptor IIA (CD32A): biochemical, biological and functional characterization". Immunology. 121 (3): 392–404. doi:10.1111/j.1365-2567.2007.02588.x. PMC 2265948 . PMID 17386079.